But first things first! For anyone who may have been up until this very moment sadly unaware of the existence of the above -- they're quite common in America and the UK, but you'd never find them on any menu in Italy, for example -- allow me to explain. 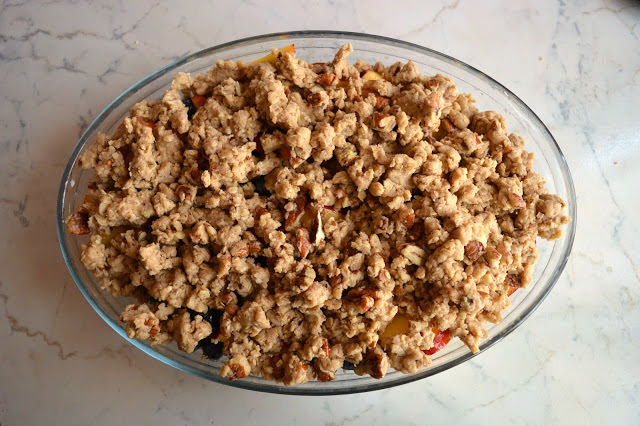 Cobblers, crumbles, and crisps belong to the same dessert family, with all three consisting of fruit covered with a butter/sugar/flour based topping that is then baked in the oven. 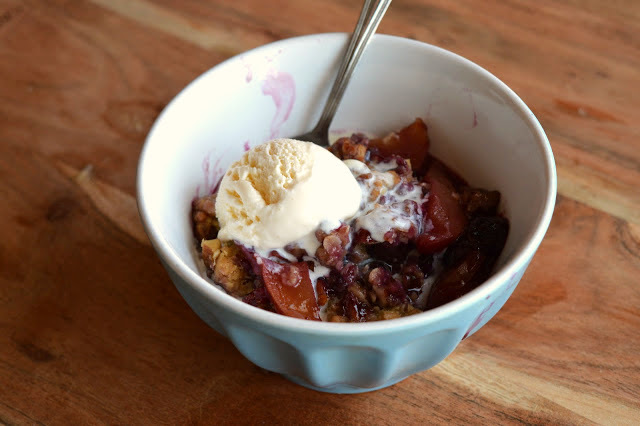 They can be differentiated from one another by way of their aforementioned toppings -- the cobbler has a thicker, biscuit-like topping, the crisp more of a pebbly, sprinkle-friendly topping, and the crumble, well, a topping that is crumbled over the fruit in larger, more substantial pieces. They're incredibly versatile -- use any fruit you'd like -- but are especially lovely in the summer when berries, cherries, and stone fruit are at their best. 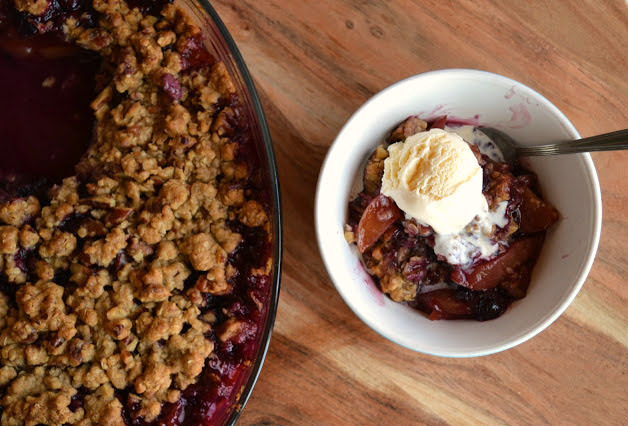 If you turn on your oven but once this (sweltering, sweltering) season, use it to make one of the three, or if you want my advice, go ahead and make this Nectarine and Blueberry Crumble. This dessert is truly spectacular, so much so that most of it disappeared in record time after coming out of the oven and was declared perfect as it was, no recipe-tweaking needed (hurray!) And with good reason: the topping here is reminiscent of an oatmeal cookie, crisp and crunchy and spiced with cinnamon, with a good dose of buttery pecans throughout, all heaped a top a pile of at-their-peak super-sweet and very juicy nectarines and blueberries that emerge from the oven bubbling cheerfully. 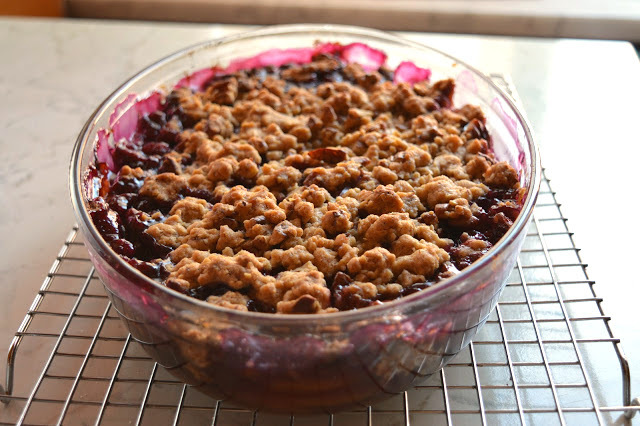 This crumble is sublime served warm with a scoop of vanilla ice cream -- I actually think the ice cream should be required here -- and there is probably no better way to end a summer-y dinner or barbecue. Having said this, whatever potential leftovers you may end up with are also deliciously refreshing eaten cold out of the fridge the next day, when you're sitting in your very hot apartment watching Netflix and trying to catch a breeze from your very feeble fan. Ehem. A few notes: You can substitute other types of stone fruit for the nectarines (apricots, peaches, plums!) and other berries for the blueberries (blackberries! raspberries! strawberries! also cherries would be nice) You can also substitute other kinds of nuts for the pecans (walnuts or almonds, for example). 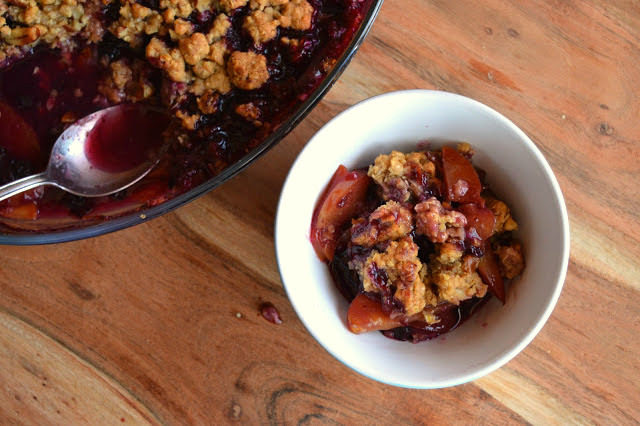 As you can see from the photos I chose to make this crumble very blueberry-centric, hence it's purple-y hue (about 2 cups or 200 grams blueberries) but if you want the emphasis to be more on the nectarines, feel free to reduce the quantity of berries (to 1 or 1 1/2 cups, or about 100-150 grams). Finally, the cinnamon quantities below are good to start with but I ended up adding a little more in the filling and topping because I like my desserts cinnamon-y -- feel free to reduce or up the amount depending on your tastes. 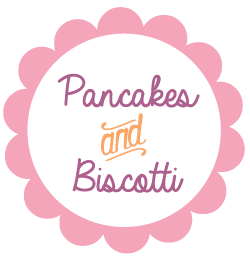 Looking for other cobbler/crisps? I've got this Peach Cobbler, this Plum Cobbler with Cinnamon Biscuits, and this Apple Pecan-Crisp. 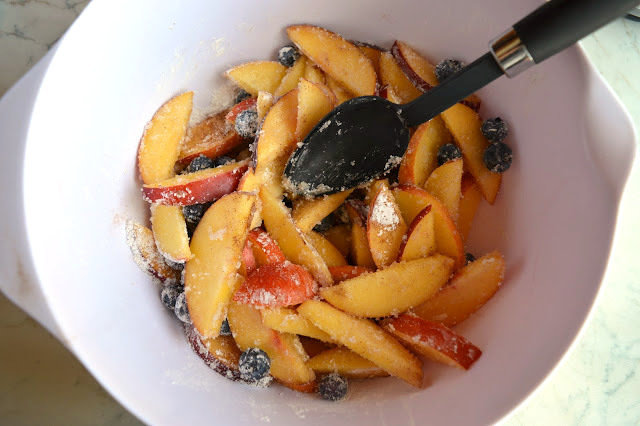 Looking for other summer fruit recipes? 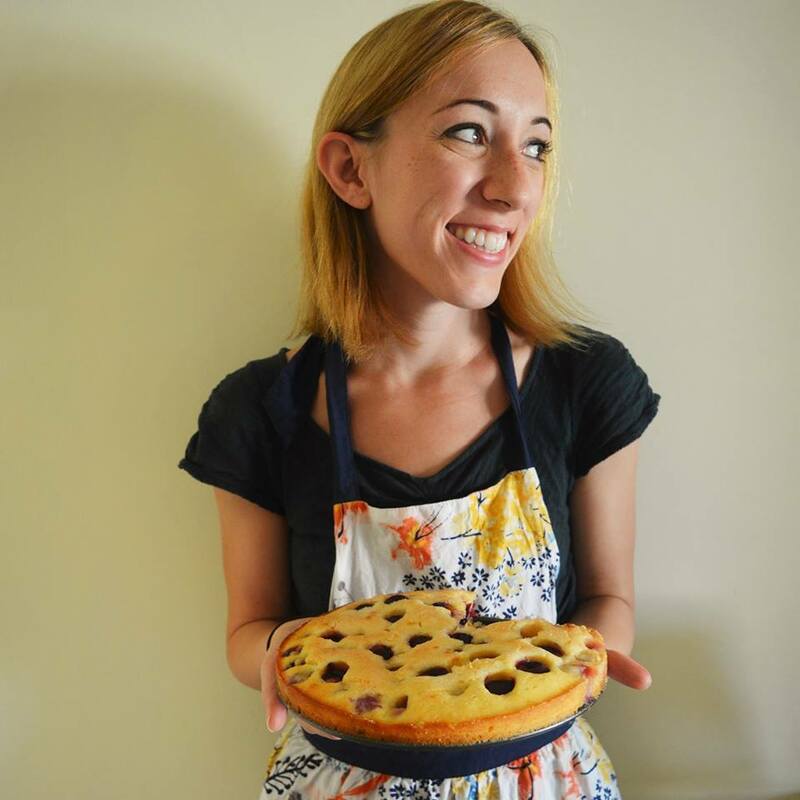 I've got this Blueberry Pie, these Blueberry Pie Bars, these Raspberry and Blueberry Shortcakes, this Watermelon Granita, this Peach and Raspberry Buckle, these Honey-Cinnamon Roasted Peaches, and this Blackberry Cheesecake Galette. Start with your topping. 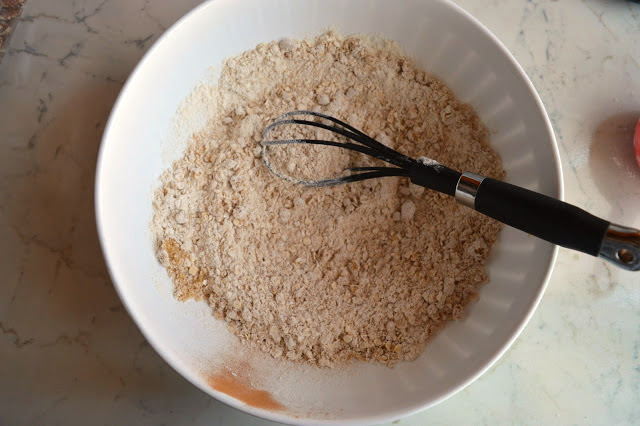 In a medium sized bowl, mix together the flour, oats, brown sugar, cinnamon, and salt. Add the butter and rub in with your fingertips until the mixture comes together and forms clumps of dough. 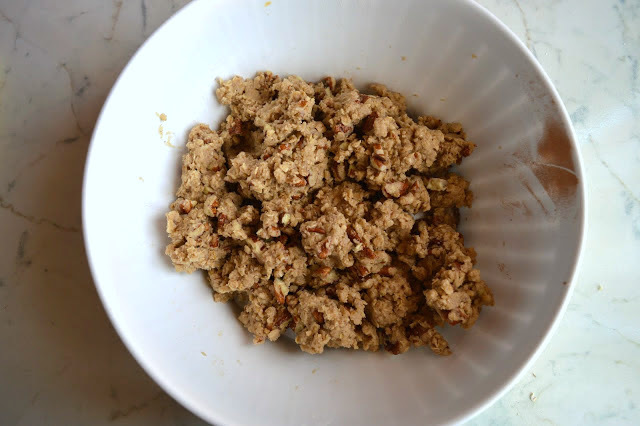 Stir in the pecans and set aside. For the filling, preheat your oven to 350 degrees Fahrenheit (170 degrees Celsius). 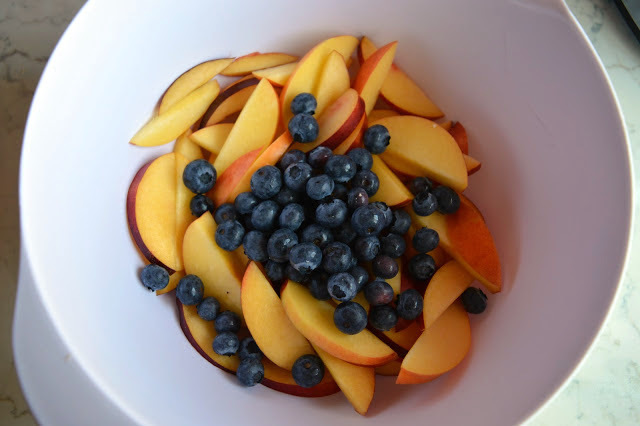 Mix together the nectarines and blueberries in a large bowl, and then toss with the sugar, cornstarch, cinnamon, and salt. Transfer the fruit mixture to a lightly buttered 11x7x2 inch glass baking dish. Sprinkle the topping over. Bake the crumble until the filling is bubbling and the topping is golden, about 45-60 minutes. Cover the crumble if the topping appears to be browning too quickly (mine did). 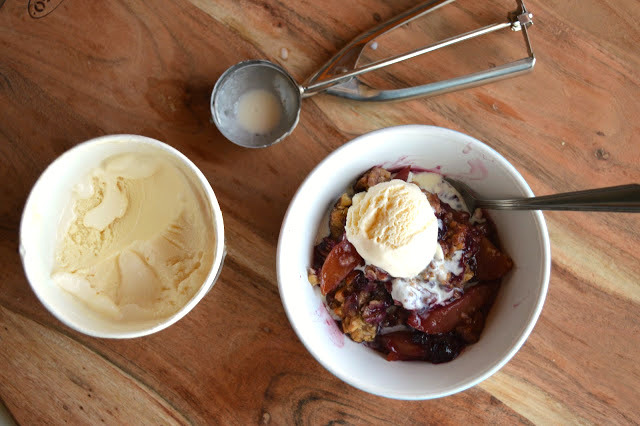 Cool the cobbler for at least 30 minutes and then serve warm with vanilla ice cream. Serves 6-8. Hahahha yes the pecans are from you!!!!! I forgot to mention that! I also used them in some blondies recently!! !